We have a choice of 3 beautifully restored VW campervans in a wonderful range of colours, available for wedding hire, including a classic, 1967 VW splitscreen and all seating up to 6 passengers. These are all chauffeur driven for your wedding in Scotland. We also have a 1934 vintage, convertable, Triumph wedding car, also from a time when everything went at a slightly slower pace. So can we tempt you to ditch the fast paced digital world for a while, & enjoy the view from the slow lane on one of the most important days of your life? We are a small, couple run company based in Forfar, Angus in the East of Scotland. Our chauffeur driven wedding hire service covers Dundee and Angus as well as Fife, most of Perthshire and Aberdeenshire. 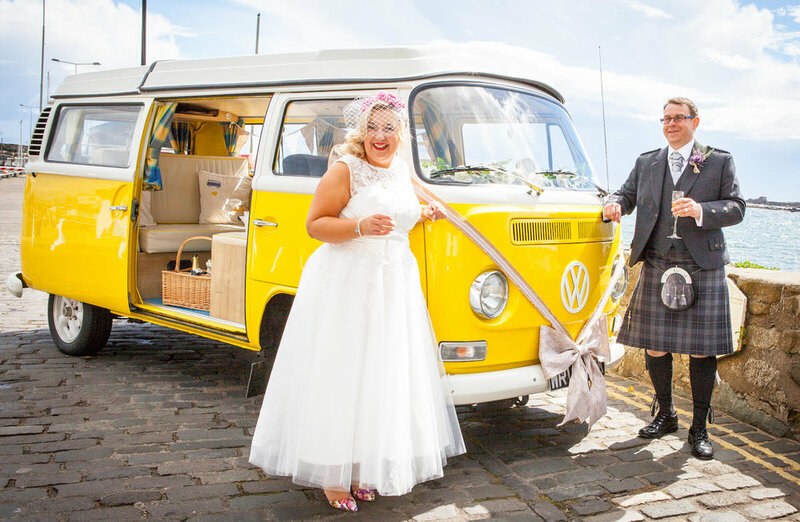 If you are planning a wedding then please check out our vehicles page to get more details on our VW wedding campervan hire in Scotland. Looking to make an entrance at your wedding ? All our vehicles are available to hire on a chauffeur driven package which includes everything you could need from umbrellas to bottles of bubbly and plenty of time for lots of photos. Our stunning VW Splitscreen and Bay window campervans have unique interiors tailored for weddings, with a champagne bar from Scottish burr oak. The campervans all carry 6 passengers; while our vintage Triumph Gloria wedding car has a convertible, soft top tourer roof, fabulous for photos & can take 3 people. The yellow VW camper van. LHD with wedge shaped pop up roof. Available chauffeur driven as your wedding car. Seats 6 passengers, 1 driver. The light blue VW splitscreen camper van. Specially designed as a wedding car. Chauffeur driven, Seats 6 passengers, 1 driver. The pastel green VW camper van. RHD with straight pop up roof. Chauffeur driven as your wedding car. Seats 6 passengers, 1 driver. The maroon soft top vintage wedding car. Chauffeur driven, seats 3 passengers, 1 driver.